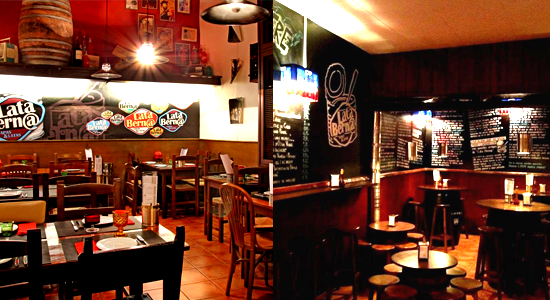 With over 50 original and delicious tapas on its menu, Lata-bern@ - a small gem in the Gràcia district of Barcelona - has become a reference point of the gastronomical renaissance taking shape in the area. Gràcia, a vibrant melting pot of all types of people, is experiencing a culinary facelift as many restaurants have popped up bringing haute cuisine to this part of Barcelona that had little of it before. Lata-bern@ symbolizes this progressive trend of offering highly creative and inexpensive tapas, and the man behind the scenes is Juanjo Martínez who has over 15 years of experience working at places such as the Ritz Carlton group and at the famed Hotel Arts in Barcelona. When you enter Lata-Bern@, the place resembles a decorative tavern, lined with whimsical art pieces, lamps made out of large tin cans, blackboard walls with chalk drawings and writings, wooden stools and wooden wine barrels substituting as tables. The back room has regular tables and chairs which can cater to larger groups in a more intimate setting. The place is dimly lit, yet quaint and inviting. Always attentive and friendly, the staff treat you like family and can knowledgeably guide you through the menu and offer the best recommendations. And then there are the tapas. Ah, those tasty, tasty tapas. Among the more original creations are unique versions of well-known dishes such as croquettes, patatas bravas and ceviche. The ceviche, which was one of my personal favorites, is presented in a round plastic container that allows the bartender in you to take charge and shake it up to your liking before serving. Other outstanding dishes include the Magyu beef blood sausage with caramelized apple and Padron pepper, perfectly combined and rich in taste. Of the 8 items I tried, none of them disappointed. So, if you ever find your hungry self in the Gràcia district of Barcelona, and want to enjoy innovative and palatable tapas without putting a strain on your wallet, this is one spot you really need to check out. Address: Torrent de les Flors 53, Barcelona, Spain. Opening hours: Tuesday - Sunday from 1:00 pm to midnight.